I have thoroughly enjoyed playing through the queer Cyberpunk adventure game Read Only Memories. However, that release was far from the end of development. As of the latest update, the “2064” patch has been released for PC and PS4. And, I’m looking forward to getting into the land of Neo-San Francisco once again. Perhaps the biggest addition to Read Only Memories, and the one I’m most excited about, is the inclusion of voice acting. And boy do they have an all-star roster lined up. As of now, if you own the game you can play with the voices included. That alone is enough to “pop the disc in”, so to speak, but there’s more. In fact, there’s a lot more than just adding a few pieces of sparkle to the mix. 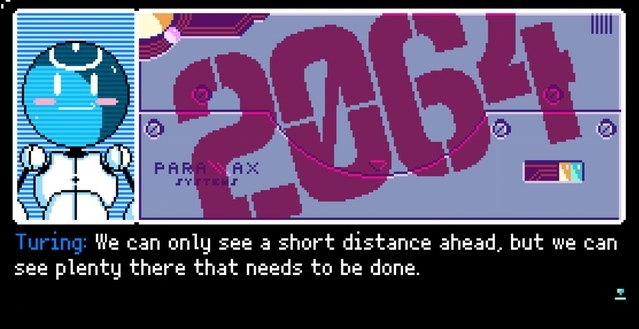 It wouldn’t be an expansion leading from “2063” to “2064” without more content. New areas, puzzles, and story have been added to Read Only Memories. To add to that, the “Endless Christmas” DLC has been expanded upon, too. Basically, there’s enough there to get anyone who’s enjoyed the game previously to pick it up again. And I certainly plan on doing that myself. To celebrate hitting this milestone, Midboss also released a new trailer for Read Only Memories, which you can watch above. It even comes complete with the voice actors speaking their lines. And, I must say it’s worth listening to just for that. All in all, Midboss has shown they can make a great queer game dealing with sensitive subjects in a traditional Cyberpunk setting. If you haven’t already played it, do yourself a favor and do it now. Or you can read our previous coverage. Whatever.